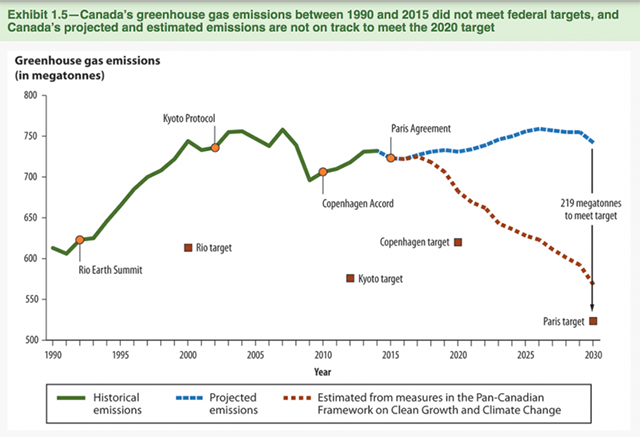 Canada has set a 2030 target of reducing its GHG emissions by 30% in relation to 2005 levels. This is the target established by the Harper government. 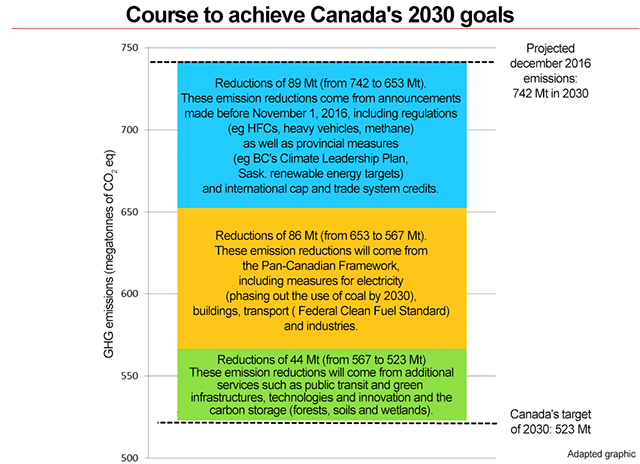 To do its fair share under the Paris Agreement, Canada, like the other Paris signatories, must set a more ambitious GHG reduction target. Halfway through its mandate, will the current federal government be able to reposition Canada as a leader in the fight against climate change? 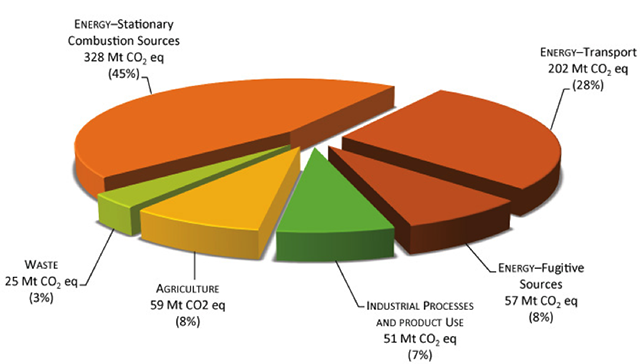 Without action by the federal or provincial governments, Canada's annual greenhouse gas (GHG) emissions are expected to be between 697 and 790 megatonnes of carbon dioxide equivalent (Mt CO2 eq) in 2030, without taking into account the contribution of the land use, land-use change and forestry sector, whereas our national emissions target is approximately 523 Mt. The Government of Canada collaborated with the provinces and territories to devise a national plan to combat climate change, adopted in December 2016. This historic agreement constitutes a major step toward fulfilling, together with the 11 signatory provinces (Saskatchewan and Manitoba have not signed), the commitments Canada undertook in Paris. This Pan-Canadian Framework contains new commitments in all the spheres of activity recommended by Équiterre. … NOW IT’S TIME FOR IMPLEMENTATION! Efforts to implement the plan, however, are lagging behind. The more we wait, the lower our chances are of reaching our GHG reduction target. None of the measures promised in the plan to bring about the 86 Mt reduction described above have been implemented to date by the federal government. Table legislation on carbon pricing in Parliament. Amend current regulations on coal-generated electricity production with a view to phasing out its use by 2030. Implement federal regulations to reduce methane emissions from the oil and gas sectors, including from offshore activities, by 40-45% by 2025. Implement the national Clean Fuel Standard to encourage use of clean technologies and lower-carbon fuels, while promoting alternatives such as electricity, biogas and hydrogen. Implement the strategy to increase the number of zero-emission vehicles in Canada. 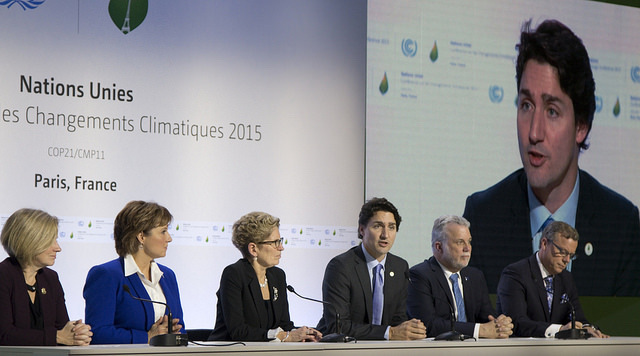 Fulfil our commitment to the G20 to eliminate federal subsidies on fossil fuel production. by signing the petition to eliminate fossil fuel subsidies! According to the Commissioner of the Environment and Sustainable Development, the federal government has done a good job managing the funding for clean energy/technology projects and demonstrations. Canada has also signed the Kigali Amendment to the Montreal Protocol, as well as tabling regulations aimed at significantly reducing the consumption of hydrofluorocarbons (HFC) and banning the manufacture and imports to Canada of certain products containing HFC. This is on top of the measures already introduced to increase the recovery, recycling and destruction of HFC present in refrigeration and air conditioning equipment.